There are certain skills in gymnastics that are building blocks for many other skills. Looking to perform these basics perfectly will make it easier to progress and improve your gymnastics! You might also be interested in 10 Exercises You can do at Home to Improve your Gymnastics Skills. The handstand is arguably the single most important skill and position in the sport of gymnastics. It’s the building block for essential skills on each of the four events. Being able to do a perfect handstand is one skill you should learn to master. The handstand is used in most tumbling skills — walkovers and handsprings. The handstand is important on bars — cast to handstands and giants are in the handstand position. Handsprings on vault pass through the handstand position. One of the keys to nailing the back extension roll in the level 6 floor routine is to hit a perfect handstand in the middle of the roll. You can practice handstands at home by doing Spiderman against the wall. Spiderman against the wall (see a picture explanation at this link) is one of my favorite exercises for improving your gymnastics skills at home. Spiderman against the wall is basically a handstand against the wall, but it’s a way to practice handstands with correct form. To do Spiderman against the wall, stand with your back against a wall in your house. Put your hands on the floor in front of you, and one at a time put your feet on the wall. Walk your hands closer to the wall as you walk your feet up the wall, until your stomach is touching the wall and you are in a handstand position. The tops of your feet should be flat against the wall, with your pointed toes touching the wall (your toenails will be against the wall). Keep your head neutral but look at your hands with your eyes. Hold this for as long as you can before coming down. While you are in the handstand, concentrate on tightening up all your muscles and think about pulling your feet up to the ceiling. This is a great way to practice good form because the wall forces your body to be absolutely straight. Learn more about how to do a handstand. Casting is the most basic bar element, and learning how to cast well early on will help you learn so many other skills. Body position in the cast is a hollow body shape. The hollow body shape is similar to the shape you have in a perfect handstand other than the fact that your back is slightly rounded with your stomach pulled towards your spine. You will eventually be casting to handstand, so the higher you can cast with a nice tight body position the better. You want your legs to be together and straight, your stomach pulled in, your back rounded and your eyes looking at the bar. Learn how to do a cast handstand. Mastering your side and middle splits will help you execute other skills that use that same shape as well. And your splits are easy to practice at home. The split “shape” is everywhere in gymnastics — split leaps, jumps, switch leaps, in the middle of backwalkovers, etc. The better you can do your splits on the ground, the better you will be able to do them in the middle of a skill. You should be able to do a split on your left leg, your right leg and a middle split with your legs straight and all the way to the ground. If you’re having trouble getting your splits all the way to the floor, learn some tips for increasing your flexibility. The handspring on vault is the basic skill that all upper level vaults are based off of. It will be hard to succeed at Yurchenkos or twisting vaults if you haven’t figured out the mechanics of the handspring vault. To do a great handspring on vault you need to run fast, jump hard “punch” off the spring board, fly through the air and hit a perfect handstand on top of the vault table, block using your shoulders off the top of the vault and land on your feet. The first basic gymnastics skill is in play here also — the handstand. A back handspring is an important gymnastics skill to master because it is the basic skill used in back tumbling on floor and beam. It will be hard for you to connect upper level skills (like layouts, full-twists, back tucks and double backs) to a roundoff back handspring if you can’t do a proper back handspring. The roundoff and the back handspring are both crucial for providing power to whatever comes after it. For more help with a back handspring head over here to How to Do a Back Handspring: The Steps to Learning and Mastering One. A roundoff is just as important as a back handspring to master for tumbling on floor. The roundoff gives power just like the back handspring does to the tumbling pass. Learn how to do a perfect, powerful roundoff. The turn on 1 foot is a skill that doesn’t go away. It is required in every floor and beam routine gymnastics levels 4-10. 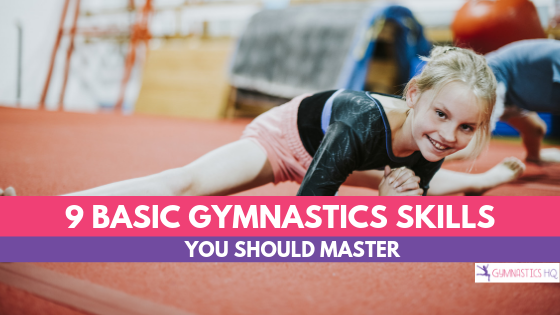 So you might as well master this basic gymnastics skill right away. The split leap is another skill that is required in every floor and beam routine levels 4-10. To have a perfect split leap you want to be able to do your perfect split position in the air as high as you can off the ground. You also want your split to be even — both legs should be the same distance from the ground. Tap swings on bars, along with casts, are a building block of bar routines in all gymnastics levels. A tap swing is a swing on bars, but at the back of the swing you should “regrip.” This means you should come off the bar briefly and re-grab. At the back of the bar your body should be in a hollow position, underneath the bar you should move to a slight arch position as you “tap” your feet higher in the front of the bar. This just means that your feet will come forward to create a slight hollow in your body again. 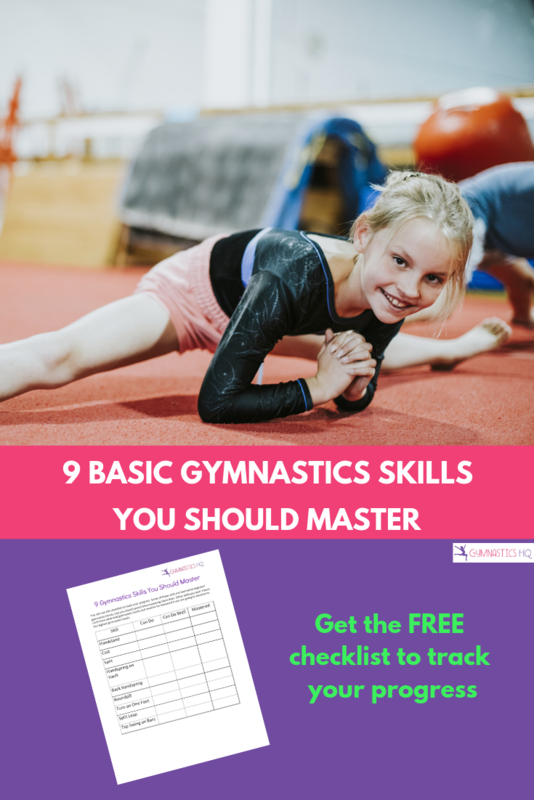 Good Luck mastering these 9 basic gymnastics skills! Do you have home gymnastics equipment ? If so, here are gymnastics exercises you can do using your home beam, mat or bars. Wow, these are basic moves? They look intermediate and advanced to me and I’m a gymnastics coach! 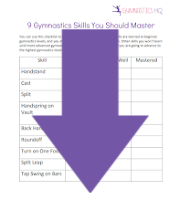 Most of these skills are basic skills for team gymnasts. Just keep trying and don’t give up! Good luck! Your picture of Gabby Douglas is not a cast, it’s the completion of a Pak salto. The reason why it hurts is because you need to to stretch it more. Do your center splits every morning and before you go to bed, soon they won’t hurt as bad anymore because you will be stretching out your muscles. Never push down too far, as this can pull a muscle. Hope this helps! Good luck! You could always use YouTube videos. They help really well. I got my splits in a week thanks to watching one single YouTube video! I would recommend SevenGymnasticsGirls. If you are trying to learn basic gymnastics skills, then you should go to YouTube. There are lots of videos that can teach you cart wheels, handstands, bridges, splits, and back walk over‘s. If you are trying to do more advanced skills, I suggest you do a little research on your computer and look for a local gymnastics gym. It’s very important to have certified coaches and equipment to stay safe! Hope this helps! Love all your content. You are always on point on your advice. Keep sending your emails. I really appreciate the information found in them. i only see 8 moves on this page? Great Post. These are all pretty basic skills; however, this post really shows the importance of each skill and how it should look when mastered beautifully–which is wonderful because a lot of the skills are required skills for my 8 y/o daughter (JO 5). Many of the skills (like leap jumps and turns) are things even Elite gymnasts have to continually work on as the requirements continue to get more and more strenuous. I love the piece on bars. When my gymnast fully developed her back hip circle (on the high bar) and tap swings, a new world opened up for her. She was doing baby giants within minutes. These skills are really the building blocks of a gymnast! Thanks for the post!! I’m still trying to master the handstand!